The Scarsdale School District, unlike many other districts, does not contract out its student transportation services: it owns and maintains its own 90-vehicle fleet. The Transportation Office is responsible for the operation of that fleet, and for the hiring and training of the drivers. The operation, which transports students over a half million miles each year, has an excellent track record for safety, consistently earning high ratings from the NYS Department of Transportation. Transportation is provided to all students in the District to the District schools, and to schools outside the District, provided that the student resides within the Scarsdale School District and resides more than 1.5 miles from the school s/he attends up to a distance of 15 miles. The distances in each case are measured using the nearest available publicly maintained route from home to school. Transportation is also provided to District athletic events, extra-curricular programs and school-related field trips. Students attending a Pre-K program are not eligible for transportation. Eligible applicants will be notified by end of August regarding the bus schedule and safety rules. 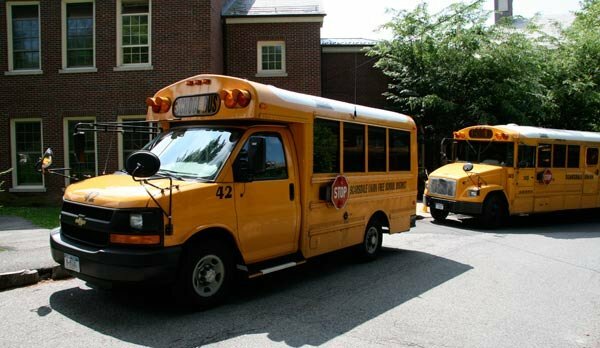 For information about Lost and Found or transportation cancellations for private school students, call the Bus Compound at (914) 721-2433 or (914) 721-2434. Please do not hesitate to contact me if you require additional information about student transportation.